Even though Danielle loves food, she is really unhappy with the consequences. She says she doesn’t like her belly because ‘it’s massive and just not attractive’. Gizzi told Danielle she was going to show her a replacement for the fizzy pop that she would get the same kick out of but that would be so much better for her health and weight. But the thing is, the average pint of beer contains 230 calories. So just in drinks on her night out, Danielle is consuming at least 1150 calories. That’s without the kebab to round the evening off! And the calories from beer are completely empty – they have no nutritional value whatsoever! ‘Erm. Cream cheese, double cream, icing sugar, lemon, vanilla, butter and the biscuits.’ All adding up to a whopping 7,500 calories for the cheesecake and 617 calories per slice! There was also more fizzy pop, full fat cream cheese and a half eaten Chinese takeaway in Danielle’s fridge. Gizzi said it wasn’t looking good! Danielle’s fizzy drink obsession means that every day she is slugging 49 teaspoons of sugar in her drinks alone! That works out at 686 calories which is almost half her recommended daily intake and that’s before eating anything. Gizzi told Danielle her first recipe was going to be a home-made Blackberry and Orange cordial which she said was really simple. With this recipe Gizzi had a trick up her sleeve. Another ‘super ingredient’ - Agave nectar. Never heard of it? You’re probably not alone so, keep reading! It’s the nectar of a cactus plant which means it’s sugar, just not as we know it! Danielle tasted it and said it was really sweet. Agave nectar is a good substitute for processed sugar. Its slower releasing, natural sugars leave you feeling satisfied for longer – good tip there. Once the cordial is made, if you mix it with fizzy water, you have a healthy, lower calorie fizzy drink. The recipe that Gizzi made would make 22 glasses of juice. The downside is that it looks like it might stain your wooden spoon! Once the cordial had cooked down into a syrup, Gizzi got Danielle to taste it. She said it tasted just like jam. The naturally occurring vitamins and minerals in the cordial will increase Danielle’s energy and should help reduce her sugar cravings. Danielle’s seven cans of fizzy pop come in at a massive 686 calories. In seven glasses of Gizzi’s cordial there is a sedate and much more waist-friendly 182 calories. So 500 fewer calories just in Danielle’s drinks a day! When Danielle tasted the drink she looked pleasantly surprised. She said it was really nice. Gizzi said that she thought it beat a can of pop any day and Danielle agreed with her! All she has to do is chuck the bean bag in her handbag and get it out when she has some time and some space – perfect! Great tip there. Another of Danielle’s downfall dishes is Pie ‘n’ Mash – a real Cockney classic. But if she carries on eating this dish, it will definitely mean ‘Barney Rubble’ (trouble for those of you who don’t speak Cockney Rhyming Slang!) for her waistline! So, Gizzi’s challenge is to replace Danielle’s Cockney favourite with something that is a bit less belly busting! Is she up to the challenge? Gizzi used Shin of Beef because there’s not a lot of fat on it and it’s a cheaper cut. To prepare it, she made sure she cut all the extra fat off it. It’s amazing how the extra bits of fat that we leave on can stack up the calories. Good tip there. She added shallots to the pie filling to bulk it out without adding fat and, added bonus, add some sweetness as Danielle does have a bit of a sweet tooth. Gizzi also added plain flour to the juices to thicken up the sauce without having to add butter – great skinny tip! The beer and red wine that Gizzi added to the filling will bring a huge amount of flavour to it but, don’t worry about the alcohol because the cooking neutralises most of it so, not a lot of chance of getting pie eyed! While Gizzi was making the pastry for Danielle’s pie, she used another secret ingredient to help keep the calories down. Now, even though it’s considered to be quite fatty, Gizzi used suet. But she used vegetable suet which has 30% less fat and 115 less calories than its beef counterpart. Yay! Another skinny tip! Danielle’s favourite Cockney comfort food comes in at a huge 835 calories per portion. 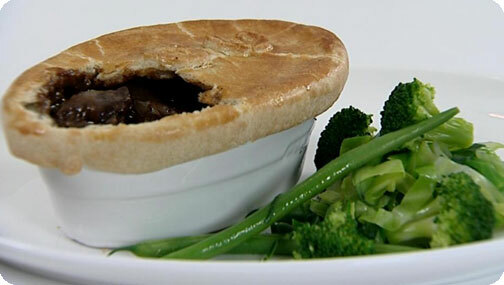 Gizzi’s rich and tasty pie comes in at just 639 calories per portion. Almost 200 calories less! Danielle has been known to polish off a quarter of one of her cheesecakes in one day! Gizzi told Danielle that just three slices of the cheesecake had the same amount of fat in them as 21 Mars bars – 220grams of fat! That’s a HUGE amount! And this writer doesn’t know anyone that could get through that amount of Mars bars in one day. Do you? Definitely time for a ‘cake-over’! Gizzi told Danielle she was going to show her how to make a less fatty cheesecake that would also have so much more flavour and be MORE enjoyable to eat. For the base, Gizzi used Amaretti biscuits. They have loads more taste than a normal digestive and have just 1gram of fat per biscuit whereas digestives have 3grams. Fat busting tip for you there! And, to help with portion control, Gizzi was making individual cheesecakes. Oooh sneaky tip there! Gizzi also used extra light cream cheese and zero fat Greek Yoghurt in place of the double cream to cut back even more on the fat. To make the topping Gizzi used fresh strawberries and a sugar free jam. ‘It’s really lush! That’s really nice. Definitely this cheesecake wins hands down. Even if I wasn’t on a health kick I could not eat 21 Mars bars!’ She looked really happy too! Danielle’s creamfest cheesecake burst with fat at 54grams per slice. 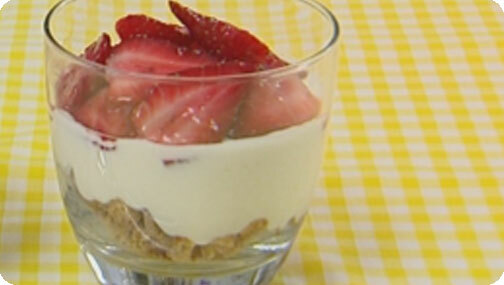 Gizzi’s individual cheesecakes float in at just 6.4grams of fat per portion! Almost eight and a half times less! Gizzi told Danielle that before she sent her on her way she had a gift for her. She gave her a steamer in a bid to encourage her to eat more vegetables. If Danielle just swaps her favourite dishes with Gizzi’s alternatives and carries on playing keepy-uppy daily, she could save nearly 5,200 calories a week and shed nearly two and a half stone in six months! Now that is how you cook yourself thin!